Friends, coffee and donut are 3 happy words for me. What an abundant life when it is surrounded by friends who care and encourage each other. I am blessed with those kind of friends. Coffee… oh I love good dark roasted coffee 😀 My husband actually introduced that to me since we got married. I was not a coffee drinker, but coffee he got have been so good! I feel in love with good coffee, strong coffee. Saturday mornings are our special time, drinking coffee together. I cut White Daisy cardstock for 2 card based, standard size 4.25″ x 5.5″ using Fiskar Paper Trimmer, then score them in the middle. For the background paper strips, I used is Sarita paper packet, this pretty paper is retired, I love the ikat pattern for sure. 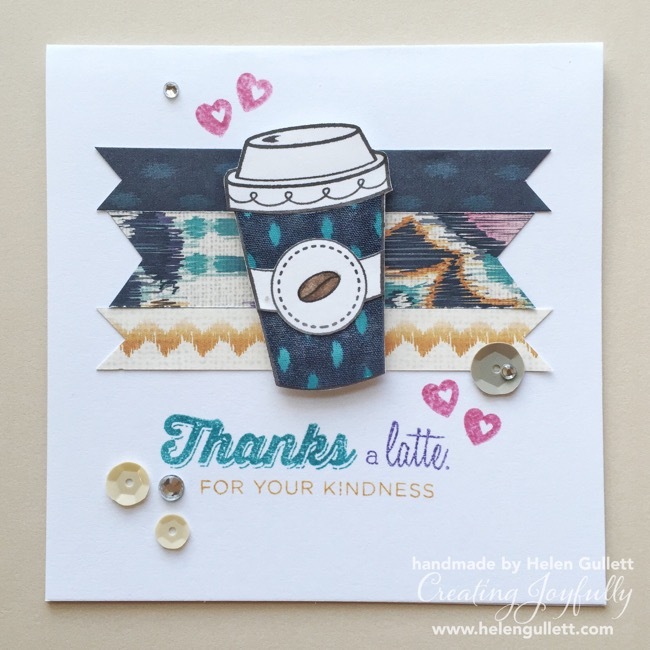 I stamped the coffee cup with Black Exclusive Inks Stamp Pad several times on a piece of White Daisy cardstock. And I fussy cut 2 cups, a lid and the band using Non-stick Micro-tip Scissors. I was thinking to give some texture and I cut a piece of Sarita fabric (retired) and glued it using Liquid Glass on the stamped cup in White Daisy cardstock. I colored the coffee bean with CTMH Watercolor Pencil and wet it using aqua brush to give watercolor effect. Since it is a cardstock, need to be very careful with the flow of the water, do not want to be too wet. The sentiment and hearts are from new stamp set, Finding The Words. I stamped them using Lagoon, Cotton Candy, Honey and Gypsy Exclusive Inks Stamp Pads. I finished my card with some sequins from the new Oceanside Sequins and Sparkle Clear Assortment. How about some donut, my friends? 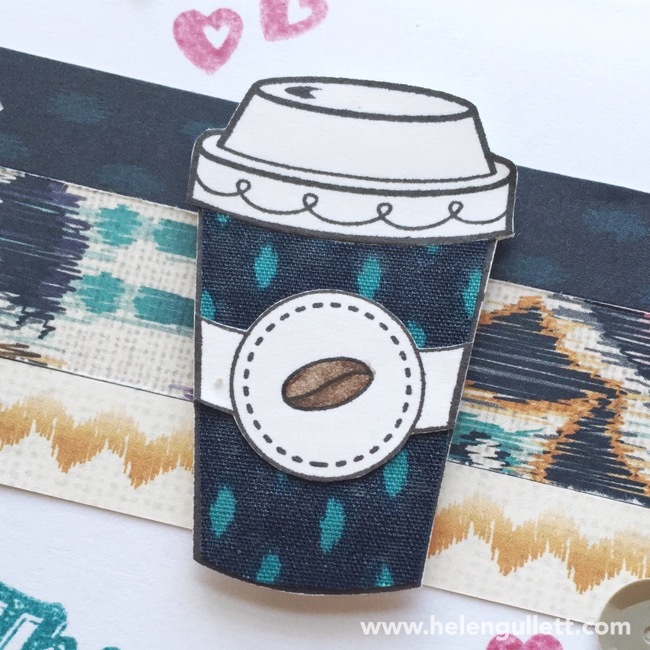 From the same stamp set, Treats of Friendship, I stamped the donut on a piece of Chocolate cardstock with Black Exclusive Inks Stamp Pad and fussy cut it using my Non-stick Micro-tip Scissors. And then stamped the donut again on a piece of White Daisy Cardstock with Honey Exclusive Inks Stamp Pad, fussy cut using Non-stick Micro-tip Scissors and colored the sprinkles using CTMH Watercolor Pencil. Using adhesive runner, glued the sprinkle on top of the chocolate donut and add them on the tag. I love these Confetti Wishes paper packet. They have fun patterns. I cut a strip of diagonal pattern paper and attached it on the card using adhesive runner. Then I cut the tag out of polkadots pattern, cut some the Silver Shimmer Trim and secure them on the tag using this awesome Mini Stapler. For the sentiment, I stamped it first using Honey Exclusive Ink Pad and then over-lapped with the Black Exclusive Ink Pad. I finished my card with Silver-White baker’s twine. Yah, now you can imagine where we live, way way from a big city 😀 We live in a country, a lovely little town. Easter is one of the most important holidays we celebrate. This is the season to remember what the Lord has done for us, to redeem us and to purchase us with His blood to be His forever. The season where we are reminded that death is defeated! Our Lord is alive. He is the Living God we adore, worship and serve. Jesus’ sacrifice on the cross makes a way for sinners (you and I) to come to the Father and be forgiven. The way He prepares for each of us to go back to the grace of God who has been waiting for so long to have the relationship with us. This is purely God’s action, solution and intention. We are offered the way of life through believing in His only begotten Son, Jesus Christ. Would you take it? Would you response to that calling? Would you answer the door He has been knocking for a while? Would you let Him restore and renew your life? The greatest love ever shown and known in the whole history of human kind is the act of love of Jesus on the cross. He died for you and me, for the world. His love for us is unconditional, unmeasured, and forever. We are called to the same thing. For this kind of love, we rejoice, have peace and will drive us to show the same love to others. God would do anything to save everyone. He is waiting patiently for each of us. Time is a great gift for us. But no one knows when the end of this grace time will come. This is the time to make decision. The Lord isn’t really being slow about his promise, as some people think. God gives lots of things for us to use to prepare our hearts for Easter, the Bible, devotions, Bible studies, and sermons every week we can listen from our Pastors. All these accesses are for us to come to know Him, to love Him and to obey Him so that we can be His witnesses to the world who He is, so that they may come to know Him and trust in Him through Jesus Christ. And for me, making Easter cards is one of the way I feel God put in my heart to share His love and words with others. Here are the first set I did.